While choosing a diamond a customer should always consider these factors: clarity, shape, cut & color which are the 4c's of diamonds. Our diamond education center will guide you step by step into finding that perfect diamond. we offer a variety of diamond shapes starting with traditional round diamonds to fancy shape diamonds. As most gemologists say cut is a very important factor of the Four Cs of diamond quality. Diamonds vary in color from colorless to slight tones of yellow. 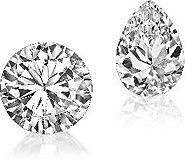 Colorless & near colorless diamonds are most brilliant. The clarity of a diamond depends on how clear or clean it is. The word "carat" is derived from the "carob" bean, which was first used to determine a diamonds weight. Great tips on how to keep your diamond shiny, brilliant and safe.